Also serving communities of Avoca, Hornell, Wellsville. There are 4 Assisted Living Facilities in the Bath area, with 3 in Bath and 1 nearby. To help you with your search, browse the 1 review below for assisted living facilities in Bath. On average, consumers rate assisted living in Bath 4.0 out of 5 stars. Better rated regions include Canandaigua with an average rating of 4.8 out of 5 stars. Caring.com has helped thousands of families find high-quality senior care. To speak with one of our Family Advisors about assisted living options and costs in Bath, call (855) 863-8283. Located in the center of Steuben County, Bath, New York is home to 12,134 residents. It lies within the Finger Lakes Wine Country, an area known for its scenic beauty, outdoor activities and fine vineyards. The city has a median age that’s higher than the national average (44.4 versus 37.4), with 30.8 percent of the population age 55 or older. There are four assisted living facilities (ALFs) serving the community, one of which is in nearby Avoca. Regulated by the New York Department of Health, these ALFs can provide basic services such as coordination of health services, personal care and case management, as well as enhanced services such as assessment and evaluations, medication administration and nursing care. Bath’s cost of living is 17.4 percent lower than the U.S. average, which can make it easier for seniors on a budget to enjoy their retirement. Health care costs are 4 percent lower than the national average. With 100 being the best air quality, Bath’s air quality is very good at 87, higher than the national average of 58. Seniors with respiratory conditions may find this area easier on their health. Seniors might find Bath's weather a little challenging. The area receives an average of 50 inches of snowfall yearly, nearly double the national average of 26, and has fewer sunny days than average. Winter low temperatures are about 14 degrees, and summer highs typically reach 81. Bath's crime rates are higher than the national average. With 100 being the highest crime level and the national average at 31.1, violent crime in Bath scores a 54. Property crime is rated at 51, higher than the national average of 38.1. This might be an issue for seniors concerned with elder victimization and crime in general. Steuben County offers Bath seniors multiple transportation options, including the Steuben Coordinated Transportation Volunteer Driver Program and Medical Answering Services, which focus on health-related transportation needs. Residents can also use the Steuben Transit Public Bus System, CEATS Public Bus System, Hornell Area Transit System, Project Care, Faith in Action and additional services. Bath is home to world-class medical facilities, including Ira Davenport Memorial Hospital, in the event of medical emergencies or illness. Assisted Living costs in Bath start around $0 per month on average, while the nationwide average cost of assisted living is $4,000 per month, according to the latest figures from Genworth’s Cost of Care Survey. It’s important to note that assisted living rates in Bath and the surrounding suburbs can vary widely based on factors such as location, the level of care needed, apartment size and the types of amenities offered at each community. 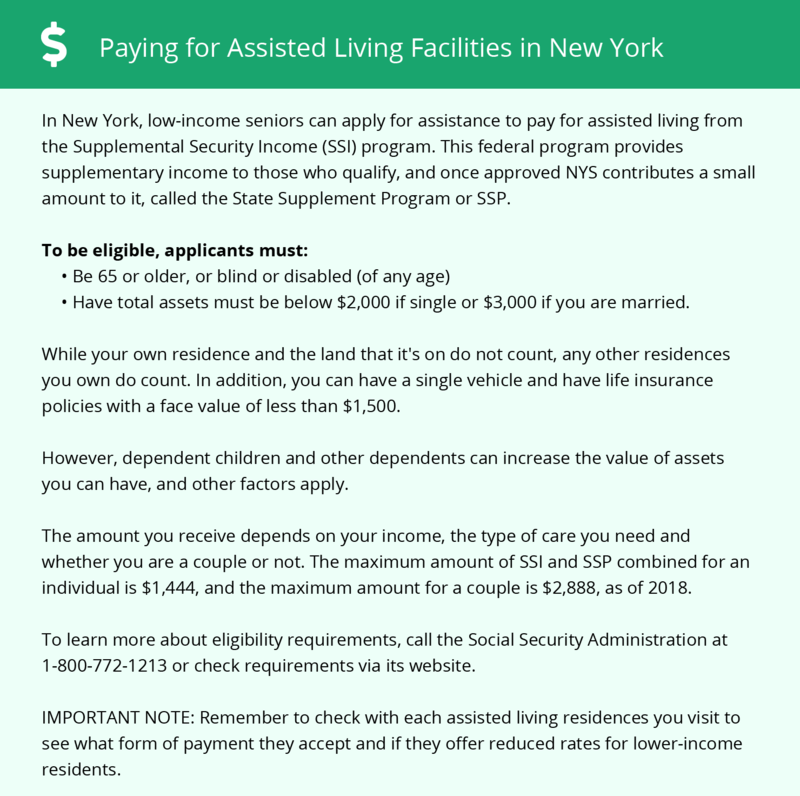 New York provides financial help for ALF services through a state supplement for SSI recipients, the Assisted Living Program, the Consumer Directed Personal Assistance program, and the Long-Term Home Health Program 1915(c) Waiver program. Bath and the surrounding area are home to numerous government agencies and non-profit organizations offering help for seniors searching for or currently residing in an assisted living community. These organizations can also provide assistance in a number of other eldercare services such as geriatric care management, elder law advice, estate planning, finding home care and health and wellness programs. To see a list of free assisted living resources in Bath, please visit our Assisted Living in New York page. Bath-area assisted living communities must adhere to the comprehensive set of state laws and regulations that all assisted living communities in New York are required to follow. Visit our Assisted Living in New York page for more information about these laws.